Are Christian children delusional? The author of the Huffington Post article, “Children Exposed To Religion Have Difficulty Distinguishing Fact From Fiction, Study Finds”, would have you think that Christian children unlike secular children cannot identify fictional stories including talking animals. Although, the referenced study did not include telling children stories of talking animals. Furthermore, this post exposes such prejudice by examining that study. Secular prejudice is exposed by such examples of twisting research. In fact, the research showed that nonreligious children had to be taught to be anti-religious and anti-God to not believe in God. The fact that so many secularists are jumping on to this story shows their gullible bias against God and Christians. Now, the bias stands out toward naturalism. For instance, the implication that altering the biblical story to become realistic presents the researchers’ bias against reality of biblical accounts. Despite the title, this study was specifically comparing Christian and secular children rather than simply the religious and nonreligious. This is seen that by the children grouped as churchgoers whose guardians taught Christianity. Add to this that they were told biblical stories including stories of Elisha, Jonah, Joseph, Samson, Peter, David, Moses, Noah, and erroneously “Libnah.” Curiously, there is no woman named Libnah who was healed by Jesus in the Bible, but the research referenced her. What does that do to the research and statistics if a child identified this story as fact or fiction? Either the researchers knew this and lied about using biblical stories, or somehow they did not know and were incapable of seeing that a woman named “Libnah” is not in the Bible. As expected, the churchgoing children were more likely and often confused when researchers identified biblical figures and stories with magic rather than God. In fact, the study found that some religious children considered fantastical stories as true when including biblical characters. Those children who did think these stories were true applied God to the biblical characters and events. As the research noted, “One possibility is that important elements in the fantastical stories sounded familiar to children with religious exposure.” Corriveau et al. observed this in their second study. 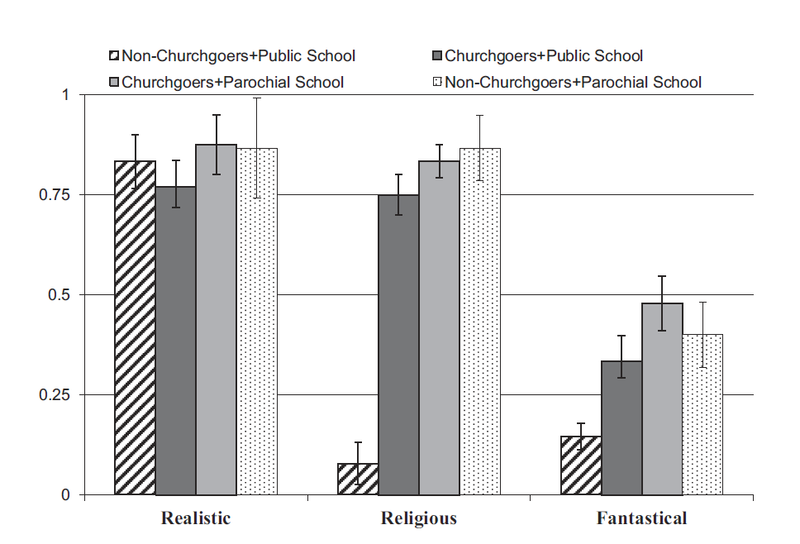 In the second study, the researchers examined thirty-three children with sixteen secular children from public school and seventeen churchgoing children from parochial school. This study looked at how these children would contrast in recognizing fact, fiction, or religion by using biblical stories without the biblical names of characters. They found that churchgoing and secular children did not accept one of the fictional stories attributed to magic. The noted results were that Christian children as well as secular children always recognized a fictional story as pretend. [C]hildren are disposed to credulity unless they are taught otherwise by their families. Thus, secular children are schooled in the idea that natural laws preclude any kind of miraculous or magical outcome. For example, their parents might cast doubt on any invocation of non-natural powers. According to this interpretation, secular children would likely differ from religious children in thinking about what can happen even when no agent, divine or otherwise, is present. Corriveau et al. should have considered further that children are born with the innate ability to believe in God and the biblical accounts. These researchers did note the book “Born Believers” (2012) in which the author, Barrett argued that children readily see the natural world as designed and purposeful. Another referenced book is “The Belief Instinct” (Bering, 2011. p.51) that noted “an insuppressible eruption of our innate human minds” by how deaf children with little or no ability to communicate with others think about the origins and purpose of human beings. The conclusion that children have the natural disposition to believe in the one God is the consistent reasoning of the Christian and a revelation of the Bible. This is Joseph. Joseph was sent to a mean king in a land far away where there were terrible storms. The king realized that Joseph was very good at looking at clouds and predicting when there would be rain. The king was so amazed by Joseph and they became friends.